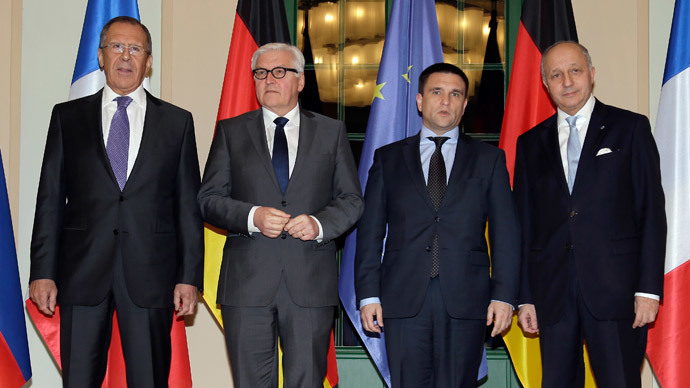 The four ministers agreed on the need for the ceasefire to be respected, as well as on the need to extend the OSCE mission in Eastern Ukraine, reinforcing it with more funding, personnel and equipment. It’s important for Kiev troops and the rebels to start withdrawing heavy weapons right now, without waiting for the time “when not a single shot is fired,” Russian Foreign Minister Sergey Lavrov said after the meeting. He added that his German and French counterparts thought it a positive development that the Donetsk and the Lugansk rebels had started to pull their artillery back. The withdrawal of heavy weaponry by Kiev troops and the rebels is part of the ceasefire deal struck in Minsk earlier in February. The Donetsk militia has announced it is complying. “Today at 9 am our units continued the pullback of heavy weaponry from the separation line," said Eduard Basurin, spokesman for the self-proclaimed Donetsk People’s Republic, Tass news agency reported. He specified that some 96 D-30 howitzers are to be withdrawn from Debaltsevo, Gorlovka, Donetsk and Telmanovo. Militia units of the self-proclaimed Lugansk People’s Republic promised to follow suit at noon Tuesday. "Today at 12 noon rocket artillery will be particularly withdrawn in the area of Debaltsevo," said a deputy commander of the Lugansk militia, Vitaly Kiselev. OCSE could not so far confirm the withdrawal of heavy weaponry by the rebel forces. Michael Bociurkiw, a spokesman for the OSCE observer mission in eastern Ukraine, said he could not comment until receiving monitors' reports at the end of the day, according to AP. Aleksander Lentsov, the Russian representative in the coordination group that oversees the weapons withdrawal, said the Ukrainian army has not established the exact framework for taking out its arms, and has only agreed to proceed after a certain date. Ukrainian military spokesman Andrey Lysenko said that two days of ceasefire are necessary for Kiev's troops to start the withdrawal of heavy weapons. The Donetsk and Lugansk militia denied accusations of non-compliance with the ceasefire. They say they are only responding to fire from Kiev troops. Ukrainian President Petro Poroshenko has meanwhile reached an agreement on weapons supplies from the United Arab Emirates. That’s according to a Facebook post by advisor to Ukrainian Interior Minister, Anton Gerashchenko. The deal was struck with the Crown Prince of Abu Dhabi and deputy supreme commander of the UAE Armed Forces, Mohammed bin Zayed bin Sultan Al Nahyan. He also said he believed the UAE blamed Russia for the drop in oil prices. “So, this is going to be their little revenge,” the adviser said. Gerashchenko said the types of weapons to be delivered and the volume of the supplies could not be disclosed. The UAE supplying weapons to Ukraine could be part of a US covert operation, former US diplomat James Jatras told RT. “This discussion in Washington about supplying weapons has been going on for some time. Usually that indicates that some kind of a covert program is already in operation and that we already are supplying some weapons directly,” he said. “There is a lot of worry in Washington that our European satellites are slipping the leash and that this Minsk 2 agreement represents a possibility of a peace settlement that is really advantageous to the anti-Kiev forces in Lugansk and Donetsk. And one way to shake that up is to pour some weapons in there,” Jatras said.